In early November the Board of Governors of Parrs Wood High School in south Manchester announced to parents that they were recommending that the School ceases being a local authority maintained school and becomes a ‘converter’ Academy. A consultation process began, scheduled to end on 7 December. Parrs Wood High School is a large co-educational comprehensive with 1800 students and about 200 teachers and support staff. It is over-subscribed, rated as ‘good’ by Ofsted – and excellent by parents. It was also mentioned by shadow Secretary of State for Education, Lucy Powell, MP for Manchester Central, in her Labour Party Conference speech as the school she attended. A public consultation meeting was held by the school on 17 November at which the well-respected headteacher (and Board member) effectively argued the Governors’ case. Central to the proposal was the view that the school should become a ‘converter’ academy on its own terms – adopting the ‘Co-operative’ model – in order to avoid the danger of being wrongly branded a ‘coasting’ school in the future and thereby forced by the Department of Education to become a ‘sponsored’ academy taken over by one of the chains widely and rightly believed to be predators. In this way the (progressive) ethos of the school could be preserved and defended as well as providing more financial freedom in a climate where local authority funding has been massively reduced. However, a strong turn out from teachers, whose NUT union reps addressed the meeting revealed that an 85 strong meeting of union members across NUT, NASUWT and Unison had voted unanimously to actively oppose the academy proposal. They viewed the proposal as privatisation, opening the door to unqualified teachers, future attacks on terms and conditions, and misconceived attempts to export the Parrs Wood ‘brand’ to less successful schools who would be added to the Multi-Academy Trust in stage 2 of the new Academy arrangements. 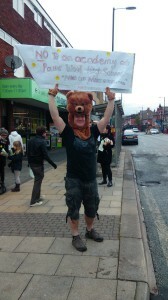 The meeting – and especially the determination of the staff – provoked a number of parents and staff to set up a campaign against the Academy plan: ‘Paws Off Parrs Wood’. The campaign has the basic aim of retaining the school as a local authority maintained state school. But given the very tight timescale of the consultation, it also has the immediate aim of extending the consultation and turning it into a properly democratic process. Within 2 weeks the campaign had gained over 600 signatures on its petition, turned out 30 or so staff and parents onto a Saturday rally / campaign stall and attracted over 50 parents, staff and local councillors to a public meeting on 1 December. Opinion amongst parents broadly falls into two camps: definitely opposed and undecided. Of the hundreds canvassed by the Paws Off Parrs Wood campaign only a handful have expressed any support at all for the proposal. 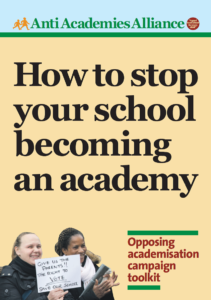 The plan to switch to a ‘converter’ or Multi-Trust Academy, operating the ‘Co-operative’ model has arisen in a somewhat different context to many other moves to academisation in Manchester and elsewhere. Allegedly ‘failing’ schools have become ‘sponsored’ academies with many academies being chains run on commercial or quasi-commercial principles. These chains are widely viewed as predators. Parrs Wood, by contrast, is recognised by all as an excellent and successful school both in terms of its academic results and its local community ethos. This justification has not found favour amongst staff or parents. There are examples of successful campaigns against becoming converter academies, such as that of Hove Park High School. The question now is whether the Board of Governors will adopt its proposal, withdraw it, or extend and deepen the consultation. Given the strength of opposition shown thus far especially by the staff within the school it is worrying that the Board has not yet agreed to requests to extend the consultation period nor to commit to transparency about exactly when and how the decision will be taken. 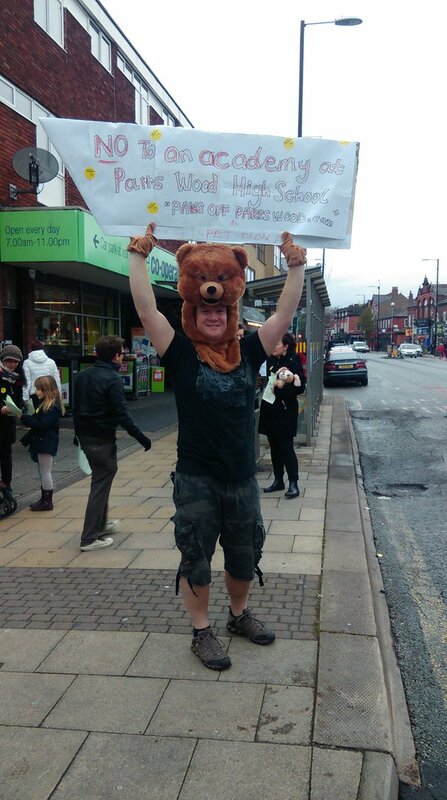 Some local councillors (the city is 100 % Labour) have actively supported the Paws Off Parrs Wood campaign and the campaign warmly invites all elected representatives to get behind it and communicate with the Board of Governors. Other councillors have asked for further information before committing themselves either way. So, in essence, the case for academisation is that it is inevitable in one form or another and jumping now before the school is pushed is the only way to protect the school from predatory chains of sponsors and any potential move by the Department of Education to enforce academisation in the future. 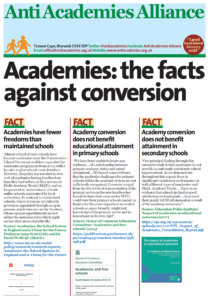 Yet converter academies can still be forced into being sponsored academies if performance was judged to be poor. Moreover, if the Board is determined to push through its recommendation in the teeth of heavy opposition from the staff and parents, what likelihood is there that the community ethos of the school will actually survive the transition to Academy status? Paws Off Parrs Wood believes that the best way to protect and advance the community ethos and educational achievements of the school – so hard won by the staff, headteacher and local school community – is to remain as a local authority maintained school. It is as a local authority maintained school that we have prospered and that is the strongest platform to continue to thrive. 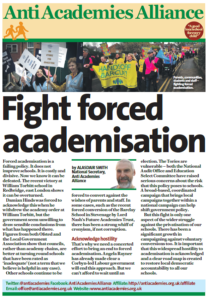 It also provides the strongest platform to face any potential threats from the Department of Education to enforce academisation IF that threat materialised in the future. The campaign has won extensive support in its short existence and is determined to continue to oppose the Academy proposals.